Games2Jolly Feed the Infant Escape info about the game-Games2Rule. 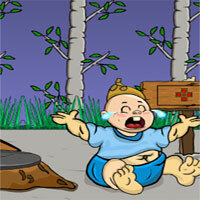 Feed the Infant Escape is another point and click escape game developed by Games 2 Jolly. There are only few things in the world which are as difficult as making a crying baby stop it's cry. Now you're in that risky job. You need to stop the baby's cry by providing milk to the cute little baby.